Spoiler warning for Arkham City – you have been warned! Batman: Arkham Knight is the ultimate Dark Knight fantasy realised in videogame form. Ever since you marched a trussed-up Joker through the high security doors of Gotham City’s notorious institute for the criminally insane six years ago, this is what Rocksteady’s series of defining superhero action games have been steadily building up to. No longer confined to the decrepit corridors of Arkham Asylum or trapped behind the towering walls of Arkham City, Arkham Knight sets us loose in a sizable open-world chunk of Gotham, plonks us in the boots of a Batman at the peak of his powers, and, for the first time in the series’ history, hands us the keys to the Batmobile. The closing part of the Arkham trilogy is a potent mix of kinetic hand-to-hand brawling, hi-tech crime scene investigating, high-speed edge-of-seat driving, fiendish riddle solving, compelling trophy collecting and empowering predatory prowling. Rocksteady have always done an exceptional job of making you feel like Batman, but now, just as the marketing materials promised, you can be the Batman. It’s been nine months since the climactic events of Arkham City. With Joker pushing up daisies, Jonathan Crane, aka Scarecrow, steps in to take the chief antagonist spotlight, having united a seriously impressive rogues gallery to once and for all defeat Batman, while threatening to unleash his trademark fear toxin on the city. He’s also got an accomplice, the titular Arkham Knight, an original and dangerous new foe for Bats to go toe-to-toe with, who has a militia of goons and drones to tear down Gotham at his will, and is hell-bent on seeing our pointy-eared hero dead and buried before the Halloween night is out. It seems the two Knights have history, and discovering who, what and why has been billed and anticipated as a major driving force in Rocksteady’s nail-biting original story. It’s just a shame that particular plotline’s payoff fails to live up to the hype. Thanks to some heavy-handed foreshadowing, you hardly need to be the World’s Greatest Detective to figure out whose mug hides behind the Arkham Knight’s fancy mask, which makes the character all the more disappointing after spending most of the game up to the ‘big’ reveal whinging at you through your earpiece. It’s an unfortunate and deflating misstep on Rocksteady’s part, certainly, but not a totally ruinous one for the rest of the story, thankfully. John Noble’s performance as Scarecrow and the trials and tribulations he puts Batman through more than make up for the Arkham Knight’s shortcomings, and that’s without even mentioning the side missions involving a gathering of Gotham’s other most wanted – some the expected fan favourites such as Two-Face, Penguin and Riddler, and some other lesser known figures from Gotham’s criminal underworld. Plus, there’s a show stealing performance which is just too big and too good a part that to say anything more here would be cruel. As if there was ever any doubt, the Arkham Knight aside, Rocksteady’s handling of the source material is up there with the very best Dark Knight works. Even though their storytelling can’t match that of BioWare, Irrational or Naughty Dog (or maybe it’s because we’re so used to them pulling the rug it now lacks impact), Rocksteady have shown once again that they’ve really got a grip on the characters and setting, delving into Bruce Wayne’s psyche and exploring the complex relationships with his friends, foes, and his alter ego. And, as Arkham City already proved and Arkham Knight further cements, they’re not afraid of pulling any punches in their stunning take on the Batman universe. If this is indeed the developer’s last hurrah with the Caped Crusader, then at least they’re signing off on a high, and adding another fine addition to the Dark Knight legacy. Of course, Rocksteady’s understanding of Batman spreads beyond the narrative margins. The main reason behind their success with the previous Arkham instalments was because they weren’t standard action games retrofitted with the license, but were instead meticulously designed from the ground up with Batman’s particular crime-fighting skillset in mind. Arkham Knight was never going to be the exception. Gotham has been considerately constructed to cater for both aerial and Batmobile navigation, Predator challenge rooms offer up numerous opportunities for gadget-aided stealth, and the peerless FreeFlow combat system captures the unrelenting brutality of the Dark Knight’s fighting style better than ever. The often imitated (and, in my view, yet to be bettered) combat system Rocksteady pioneered in Arkham Asylum has been greatly beefed up here, and it’s easy to understand why. 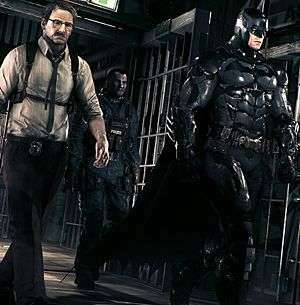 With a bigger variety and more enemies onscreen – a larger number of whom are wielding stun batons, blades or riot shields – Batman has naturally had to up his game in response, donning a swish new suit which allows him to strike faster, hit harder, and dish out more bone-crunching finishers. The system remains as elegantly simple to use yet devilishly tricky to master as ever. With attack, counter, dodge and stun mapped to the face buttons, button-mashing can see you through most fights in a flurry of punches and cape swishes on the lower difficulties, albeit with minimal XP earned and a slither of health left afterwards. But for most, the challenge has always been to pull it off in a style befitting Batman, incorporating the new environmental takedowns, a utility belt full of gadgets such as explosive gel, Batarangs and the Batclaw, and even dropped enemy weapons in one seamless and unbroken combo to rake in more XP and feel like a badass. You’ll still feel vulnerable too, and that’s the important thing. One wrong move, one misused gadget, one attack let through, and everything can come crashing down, especially in New Game + on Knightmare difficulty. It’s easy to think the odds are firmly stacked in your favour, and most of the time they probably are, but get complacent and the sharp escalation in threats as the game moves on will eventually get the better of you. With specific enemies immune to certain attacks and some capable of reviving a (thankfully) limited number of downed teammates, learning who to prioritise and how to approach each target is essential to making it out of a scrap alive. When it comes to taking down thugs armed with firearms, a change in tactics is usually the way forward, where ascending to higher ground and surveying the scene for strategic points of attack to thin the ranks will make you feel like the ultimate predator. Spraying explosive gel on breakable walls can net you anyone unfortunate enough to be standing within the blast radius; dropping from a gargoyle to string up an unsuspecting goon below never gets old; throwing a Batarang to lure a curious hoodlum away from the pack for a silent takedown is always a valid tactic. The fewer interior locations are always the best places for such Predator challenges to take place in, the enclosed and concealed spaces making it easier to pick enemies off one by one unnoticed, but Rocksteady have a done an excellent balancing job of ensuring you’re never out of options to toy with your prey in the more plentiful and exposed exterior ones, too. With some gadget upgrades you can turn some of your enemies’ gizmos against them. The Disrupter can sabotage a select number of weapons and equipment without the bearer even knowing until it blows up in their face, particularly useful (nigh, vital) against foes who can home in on your Detective Mode signal, giving them a nasty shock instead of revealing your whereabouts. 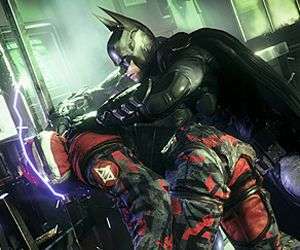 Then there are the all new Fear Takedowns, Batman’s take on Sam Fisher’s Mark and Execute system, permitting you to string together a series of up to three (more with upgrades) instant takedowns in one fell swoop. Do they make the game too easy? Not in the slightest. First, you have to earn the privilege to use them by way of a standard silent takedown, and second, in some encounters it’s tough to judge when and where they’re best deployed. Ultimately, much like every facet of the Arkham games, it’s about giving you more choice to think and act like Batman would. Whether you’re indoors or out, prefer to get up close and personal or let your gadgets do the work for you, in the midst of a mass brawl or staying incognito, the systems at play mean both combat and stealth are rich with possibilities. This is a game rich with content, too. The critical path to unmask the Arkham Knight and stop Scarecrow is a substantial and varied thread in itself, but there are also over a dozen side missions to uncover and complete which are almost games in themselves. Two-Face and his gang are taking the opportunity to raid Gotham’s major banks, Penguin has a number of weapon caches that need to be found and destroyed, and the Riddler has been up to his usual nefarious tricks, and then some. Not happy enough with setting you riddles to solve and scattering over two hundred trophies to collect across the city (be thankful it’s not as many as Arkham City’s obscene four hundred and forty), he’s also kidnapped Catwoman and, somehow, set up a few underground race tracks and other tests for Bats to complete in order to save his feline friend. Yes, it’s a tad on the implausible side, but the whole Riddler’s Revenge arc actually proves to be one of Arkham Knight’s best and most fleshed out. Collecting trophies remains as addictive a pastime as it’s always been, and in order to save Catwoman you have to routinely return to Pinkney Orphanage where she’s being held to solve a series of puzzle rooms and combat challenges (sometimes both simultaneously) together via the new Dual Play mechanic. Dual Play lets you switch between Batman and his partner in crime fighting on the fly, be it Catwoman, Nightwing or Robin, during select missions, often tag teaming your way to victory in some of the game’s more densely populated fights. It’s a neat way of bringing the wider Bat family into the picture without it feeling like a meaningless cameo or taking the limelight off the main star, as well as a fine alternative to any co-op modes which would likely do more immersion-breaking damage than good. Elsewhere in Gotham, there’s a serial killer to track down, seventeen firefighters in desperate need of a rescue, and an abundance of militia watchtowers, explosive devices and checkpoints to be wiped off the map. Regrettably, the side missions overall are something of a mixed bag, some feeling more involving, substantial and unique than others. For instance, using your ears to listen out for the tell-tale opera music signifying one of several dead bodies has been left nearby, discovering said body and then scanning the corpse on multiple levels to reveal the victim’s identity, and eventually leading to the perpetrator, is more fascinating and inventive than bringing down yet another militia blockade. Worse still is that some missions you’d hope would last longer, especially ones tying up series’ loose ends, only have a fleeting part to play, the more numerous but less remarkable objectives relating to the militia occupation seemingly taking a bigger role. Yes, it makes sense in the story, and it’s a testament to the core mechanics’ strengths that they rarely feel like the generic open-world filler they essentially are, but it’s a shame some of the more narratively interesting and creatively designed quests aren’t given as much chance to shine. What definitely is given ample chance to shine, though, is Gotham itself. Said to be five times bigger than Arkham City (which can be spotted in the distance at the south-east end of the map, and Arkham Asylum to the east), the three diverse and intricate islands which form Arkham Knight’s playground make for one of the best and most authentic open-worlds on current-gen, the layout of the land looking and feeling like a real city should, and an uncluttered UI letting the world do all the talking. And while the scope may have increased, the attention to detail hasn’t been compromised one bit, fan service at virtually every turn, from GCPD and Wayne Tower not only featured but also enterable, to the myriad other easter eggs and references we’ve come to expect from the series, some even acknowledging 2013’s non-Rocksteady helmed Arkham Origins. Five times bigger than its predecessor it may be, but you still get to know the city on an intimate scale, able to know where you are at any given time without resorting to the map screen. This is in part due to the fact that navigating Gotham is such an easy and pleasurable undertaking, where you can focus on your surroundings and soaking up the atmosphere rather than concentrate on staying airborne. Diving to pick up momentum before spreading your wings or using the Grapnel Boost to propel yourself further into the clouds is a cathartic experience which never gets old. Games like Assassin’s Creed and Sunset Overdrive might make navigation and traversal an important and fun part of the game, but only here is it an art form. And only here can you drive the Batmobile. 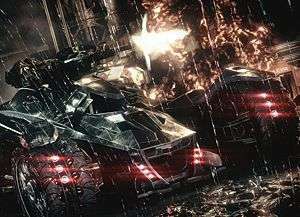 Looking like a cross between the Tumbler from the Christopher Nolan films and the version we saw back in Arkham Asylum, the Batmobile is Rocksteady’s major innovation for Arkham Knight, and boy do they make sure you get the most out of it – perhaps a little too much. Somewhat fittingly, much like a certain former Gotham attorney, it’s a device of two halves, of two qualities. In its default Pursuit Mode, it’s ace. The handling feels simultaneously nippy and weighty, and when you’re tearing through the city streets ramming enemy vehicles off the road you could almost think you’re playing a new Burnout at times. But inevitably, sooner or later, an increasing amount of the Arkham Knight’s unmanned drones will turn up to spoil the party, and the Batmobile must enter Battle Mode with a squeeze of L2. In Battle Mode, the Batmobile transforms into a tank of sorts, whereby you must engage in stodgy and repetitive combat. Much like its hand-to-hand equivalent, a combo metre is gradually filled with each successful hit, granting missile strikes for instant finishers rather than an arm-breaking takedown. Get hit and you’ll be set back a little, but the Batmobile can detect when you’re about to be shot, the trajectory of the incoming projectile represented as a glowing white line a couple of seconds before impact, giving you enough time to dodge out the way. Now, by no means are these occasions bad, as such, but their overuse and reluctance to change mean they begin to grate very early on in the game, definitely within the opening two hours. The first drone encounter is much like the next hundred, the only difference being you’ll be taking on more and more at once as the story progresses, and occasionally you’ll come up against some which can only be attacked from behind. Yeah, they are about as fun as they sound. It’s certainly not enough to derail the whole experience, and neither are the weak boss battles (always the Arkham series’ Achilles heel). The high levels of polish, the obsessive amount of detail and the deftly interwoven systems at play mean any faults related to the story, Batmobile and bosses are easily looked past. The overall quality is just too high. Some might argue Arkham Knight isn’t doing much more than Arkham City did four years ago, but that’s not a bad thing. This might more or less be the same Batman game as before, but on current-gen it looks and plays better than ever, even if some of the new bits don’t quite work so well. 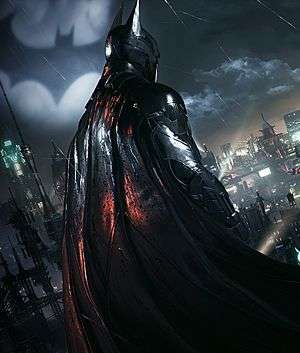 If Arkham Asylum was Batman Begins and Arkham City was The Dark Knight, then Arkham Knight is The Dark Knight Rises; a brilliant if blemished finale to a historical trilogy that redefined the blockbuster. That’s no overstatement. 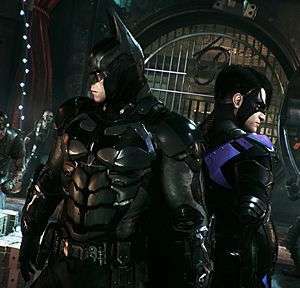 Even today developers are still taking inspiration from and playing catch-up with the six year old Arkham Asylum, and no one other than Rocksteady themselves have come close to topping it. Its two predecessors remain the undisputed kings of the superhero genre and some of the best action games ever made, but Arkham Knight is still a smart, stylish and spectacular climax that any self-respecting Bat fan would be mad as a hatter to miss.